Introduction: In recent months Okuma's been making all the right moves and continues to gain brand awareness with some of the best values in fishing reels on the market today. Okuma's redesign of their Fina demonstrates Okuma's continued dedication to bringing high performance products to market at a great price. Impressions: When Okuma's National Sales Manager, John Bretza, gave TackleTour a firsthand opportunity to compare the "New Fina" to their well known previous Fina model we were jumped at the chance to see what new enhancements Okuma could come up with. 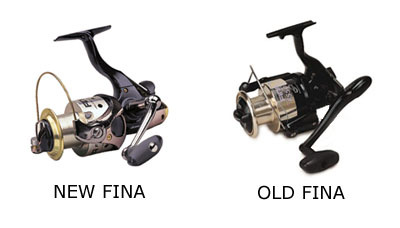 When we first received the two the old Fina looked dated right away in comparison to the much sleeker, more ergonomic new Fina. Right of the bat we could see use of more metals versus graphite. From the outlook the New Fina has a much more modern body design, but how would it perform? The Old Fina vs. The New Fina: Delving deeper into the actual physical changes the new Fina employed we found a series of upgrades that not only made sense but radically improved the performance of the new reel. 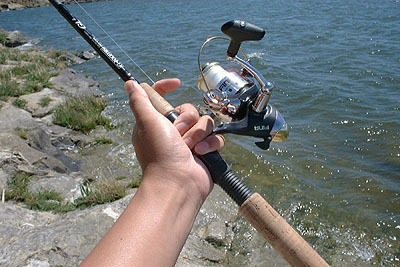 Most noticeable of the changes is the addition of a forged aluminum handle (very similar to the Okuma Metaloid) instead of the older styled graphite counterbalanced handle. Also in the lab the new Fina felt smoother at high speed thanks to a seven bearing system versus the old five. The final thing we noticed prior to field tests was the new Fina's spool was lighter because of Okuma's choice to drill the spool, and the new Fina also featured a slicker titanium coated bail. From an engineering standpoint these changes were significant, but we would find ourselves surprised to discover even more subtle enhancements during our extensive field testing. The New Fina Test: We tested the new Fina and compared it to the old Fina on many levels. Here's what we found from a series of tests on two different lakes including O'Neil Forebay which is famous for holding record sized stripers. Casting: Casting the new Fina is a real pleasure thanks to a easy to flip bail and a spool that has a smooth anodized gold lip. This is one area where the old Fina is almost as good as the new Fina. 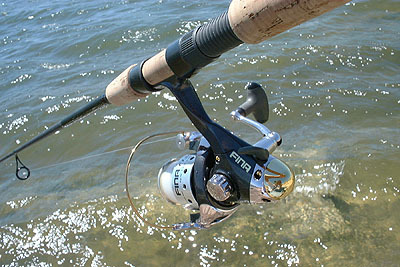 The old Fina was touted as the original Okuma "long cast" reel and both do well casting everything from large cranks to lighter striper jigs. 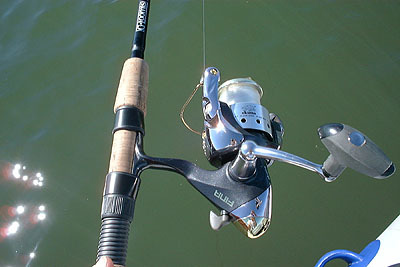 Both are comfortable to hold when put in standard Fuji reel seats. Retrieve: The new Fina started to really show its superiority in retrieve tests. The new Fina features a more precision machined brass pinion gear that is not only stronger but makes the retrieve much smoother. the new Fina also is much more precise for hooksets as the anti-reverse bearing system is absolutely perfect. The old Fina did have some "give" lending to some noticeable back-play since it did not feature an infinite anti-reverse function, but the new Fina addresses this issue well. In addition the new Fina is better suited for anglers that like to use braided line due to the new titanium coated bail which is slicker, stronger, and more attractive. Retrieve after retrieve we felt the new Fina seemed to have more muscle then the old Fina. Finally we realized this was because we were actually getting better leverage on the handle with the new soft ergonomic shape, which is much better then the small plastic handle on the previous version. Both Fina's feature 5.0:1 ratios which was perfect for spinners and plastics, but to broaden the capability range of the new Fina series, Okuma also produces a 6.3:1 "High Speed 30" version for ultra fast retrieves for those top-water applications. 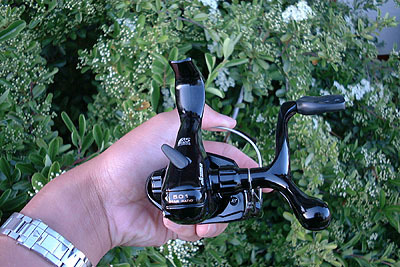 The new high speed 30 version is perfect for Bass fisherman, whereas the others are a good fit for saltwater anglers. The Drag: The drag is another area that the new Fina makes same major advancements. While the old Fina featured a pretty precise drag the new Fina incorporates two major changes. The new Fina has a much more ergonomic drag that is easier to reach and adjust quickly. In the guts of the drag the new Fina has a smoother drag system comprising of alternating stainless steel and oil soaked felt washers for increase smoothness and high end drag pressure, in addition this entire system is waterproof. When we hooked into a striper during testing at O'Neil this system was really put to the test. 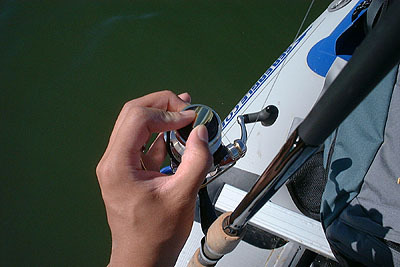 As the fish ran the drag spun smoothly and we tightened it in increments as we worked the striper in. Overall the drag performed very well and in its tightest setting allowed us to muscle fish in...even small to medium sized stripers. The details: When talking to Okuma about the direction of Okuma and the thinking behind the Fina re-design we were told; �The newly designed Fina series represents Okuma�s reputation for quality. 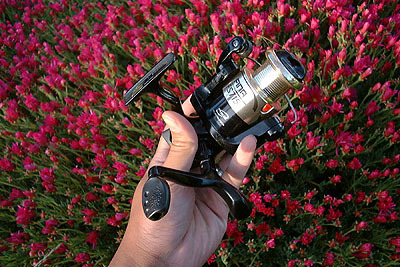 We managed to incorporate many of the high performance functions typically found in tournament class spinning reels that are 2 to 3 times the price of our competitors. As a result of our high quality and great values, Okuma products are being recognized as one of the best buys in the fishing tackle industry.� stated John Bretza, National Sales Manager, Okuma Fishing Tackle. After the detailed tests we ran on the Fina we would definitely agree that the Fina is a good example of Okuma's dedication to produce better and better products at an incredible value. Many times a new reel design is nothing more then a series of cosmetic changes, but this is simply not the case with Okuma's new Fina. Quite the contrary in fact, the new Fina includes numerous physical additions and enhancements that set it apart from its predecessor....and other reels costing twice as much in the market today. The only area that we wished the new Fina also addressed would be a slight reduction in weight, but we realize this is not possible as the new Fina makes use of some more high quality materials that include more metals, overall still a very acceptable balance. Conclusion: Okuma does it again, they have effectively raised the bar by re-designing the Fina with advanced features and improvements found in reels twice this price. The Fina represents everything that Okuma stands for, producing a high performance product that is also a phenomenal value. The new Fina not only is a major step forward from the old design but puts the product right up there as a real contender for value conscious anglers that want the most reel performance out of their hard earned dollars. You'd be hard pressed to find another reel of this quality sporting such an abundance of features, for such an aggressive price. Well done Okuma for a fantastic re-design that proves once again that it is possible to fish fantastic tackle without breaking the bank.